How to Make a Homemade Turkey Broth Recipe - Begin Prepping Now!! Homemade turkey broth is a snap and it is SO healthy. Cooking the bones to get your broth releases all the nutrients in the marrow and cartilage. This is an amazing source of vitamins, especially helpful in winter months, for fighting colds. Studies have shown homemade chicken noodle soup really is as helpful as grandma said, and so is turkey. 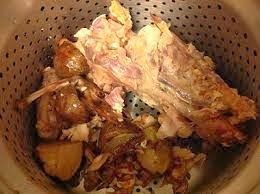 Put all the bones, and leftover meat (even if it’s dried up) into a pot, with water enough to cover at least half the carcass. Put a lid on your pot. Turn the heat up until you have achieved a hard boil. Leave it stew away for a couple of hours. Stir it occasionally, the bones will begin to separate and settle into the water. Turn off heat, remove lid and slide to cooler part of stove. Let it cool to the point that you can easily put you hands in the broth. Wash your hands, roll up your sleeves and dig in. Pick out all bones and bits of cartilage. Cut up any larger pieces meat. You now have your base broth. You can now add your favorites to make it yours. 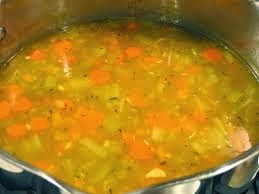 I add garlic, onion, carrots and celery. I throw all these things in to taste, bring to a boil again, then stew for an hour. Now you can add noodles, barley or put it in zippy bags and freeze your base for a quick supper at a later date. TIP: IF you put the carcass in a sieve style pot you will leave the juice in the pot and can just pick the meat pieces you want out of the sieve.